Image courtesy of the RNLI and Glenn Peterson. 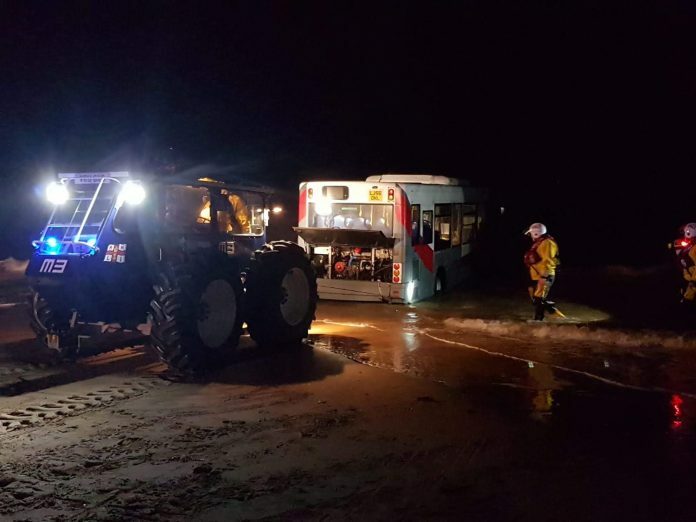 Cleethorpes Lifeboat has been called out by UK Coastguard to a report of a bus being abandoned in the water off Cleethorpes beach, next to Cleethorpes Pier. Upon arriving at the scene, the crew found the bus, engine still running, in about a metre of water, with police in attendance. After checking there was nobody inside, they towed it out of the sea at the request of Coastguard officers on scene to prevent pollution and assist with eventual recovery. They then searched the shoreline from the scene towards Grimsby to check that nobody was still in the water as a result of the abandonment. In windy conditions with a metre of swell, the search took some time to complete thoroughly, but nobody was found.